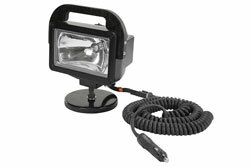 The HML-6M from Larson Electronics is a HID Spotlight with 200lb Grip Magnetic Base and Adjustable Ball Joint Mount that produces 3,200 lumens of light while drawing only 35 watts from a 12V or 24V DC low voltage power source. 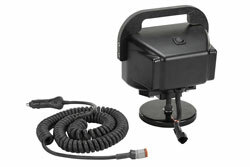 This spotlight is equipped with a 200lb grip magnetic base for quick and easy mounting to flat, magnetic surfaces. The flexible ball joint mount allows the HML-6M to be swiveled and tilted in the desired direction while the light is mounted. 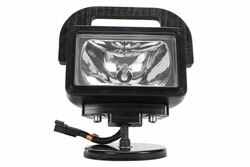 The HML-6M is a powerful HID spotlight that produces 3,200 lumens of bright white (7000K) light in a spot beam that measures 1850` long and 150` wide. This spotlight is constructed from durable cast aluminum with a durable powder coated finish and is equipped with a handle mounted on top that makes for easy transportation and swivel/tilt adjustment. The innovative ball joint mount on this spotlight allows the light to be rotated 360 degrees and tilted up to 130 degrees which allows operators to adjust the light in the direction they need it the most. A hand locking mechanism keeps the light pointing in the desired direction. The HML-6M features a hardened boroscilicate glass lens that measures 4.5 inches tall by 7 inches wide. Precision metal reflectors allow the 35 watt HID Xenon D2 type lamp to produce an 1850` long spot beam that can be used to illuminate targets from a long distance. 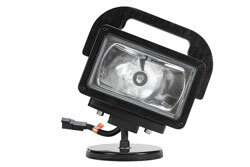 The internal HID ballast in this spotlight has "instant on" functionality and comes to full power in 15 seconds. 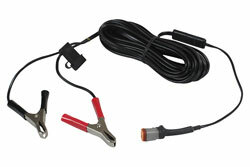 Power/Voltage: The HML-6M can operate on any voltage ranging from 9-32V DC including 12V DC and 24V DC. 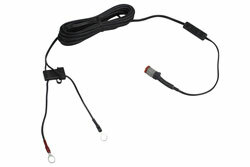 On 12V DC, this spotlight draws 4.8 amps on startup and 3.3 amps average draw after 60 seconds. 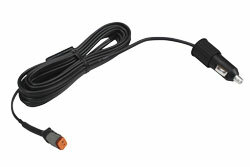 On 24V DC, this spotlight draws 2.4 amps on startup and 1.7 amps average draw after 60 seconds. 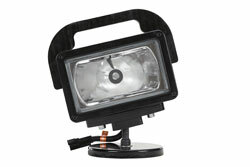 Durability: The HML-6M HID spotlight can hold up in rough and abusive conditions. This spotlight features dust and water resistance via gaskets and seals, an IP65 waterproof rating and a vibration tolerance of 8.6G RMS. 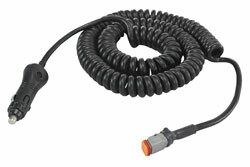 The HML-6M has an operating temperature of -40°C to +105°C and weighs approximately seven pounds. 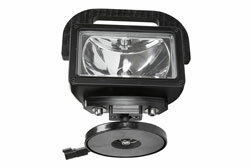 Mounting: The HML-6M HID spotlight is equipped with a five inch diameter magentic base that boasts 200 pounds of grip strength. This magnetic base makes this spotlight incredibly easy to securely mount to flat magnetic surfaces such as vehicles and guns. Suggested Applications: Hunting, fishing, off-roading, ATVs, security, military applications and any other application that requires a powerful spotlight that can withstand extreme conditions.